Our weekend wasn’t full of anything spectacular and we mostly stayed at home. But it was actually a really lovely weekend, so I thought I write a little bit about it. We kicked off the weekend by watching some of the kids from our Jr. Youth group play tennis matches. I managed to thoroughly embarrass one of the 8th graders by cheering for him and yelling his name, so I count the whole thing as a success. After spectating, we went to the Spring for pesto burgers & onion rings, and finished off the evening by watching Mad Men. We are starting the series over from the beginning because we keep getting to about season 4 and then forget to watch it and forget what’s happening and have to start over. It seems fitting that we may actually get through it right after it’s over for good. Saturday started off with a trip to the farmers’ market for veggies and a few final plants for the garden. We also bought a pound of rhubarb. (this detail will become important later in the post!) It was our neighborhood’s annual yard sale day, so we decided to check out a few sales. Well, to be honest, we’d seen a post on Facebook the night before showing the many dozens of cookies one of our Jr. Youth group members had baked for a garage sale…we wanted cookies! With both chocolate chip & no bake cookies in hand, we did score a few yard sale deals. I learned that a book series I loved as a child had 3 additional books I’d never read, so I had to bring them home. I also bought two new summer dresses for $8 total. And, as we were walking away from a sale, someone from church handed us a bag of rhubarb! She’d seen on Facebook that we were volunteering to take unwanted rhubarb, and was headed to our house to drop it off. So yes, if you’re counting, there are two pounds of rhubarb in my fridge right now. 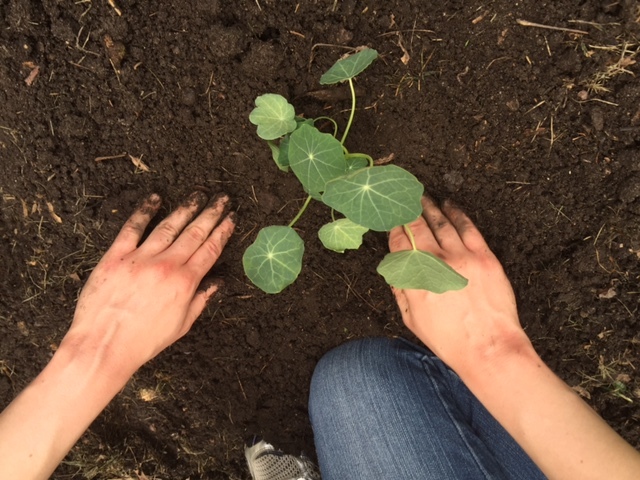 After yard sale perusing, we decided to finish our outdoor planting. I’m happy to say that the tomatoes, peppers, and cucumbers are in the ground, all the herbs are potted, and the last of the flowers are potted, too. We found at least 3 earthworms in every hole we dug. And I think it has rained at least a little every day since Saturday, so here’s hoping our plants thrive! 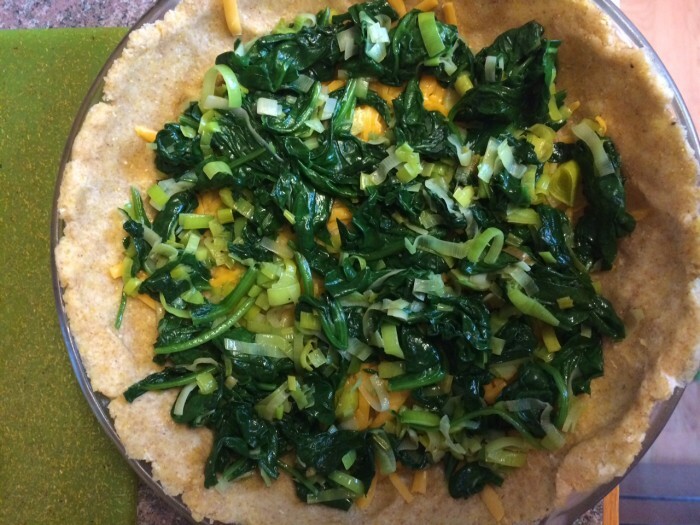 That evening I made a leek & spinach quiche which was delicious…and we watched more Mad Men. Are you surprised? We rode our bikes to church on Sunday, and then I went to work at the library for the afternoon while James did various domestic things involving upgrading some of our lightbulbs to LEDs and doing some mysterious beer-making related tasks (well, mysterious to me, at least). I went grocery shopping around 7pm, which was kind of awesome because the stores were empty and kind of terrible because the produce section at Meijer needed a total restock. 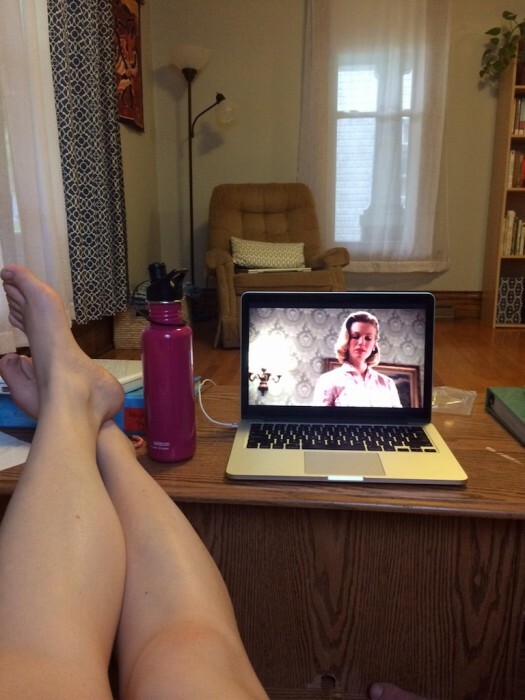 James made popcorn for me for dinner, and we again watched…wait for it…Mad Men. Sensing a theme yet? Like I said, not an earth-shattering weekend. But it was full of so many things I love and reminded me why I love living here. At the farmers market I got to meet my friend’s new 12 day old baby girl, and also picked out heirloom tomato plants. I chatted with folks I know at yard sales and got handed a heaping bag of rhubarb. 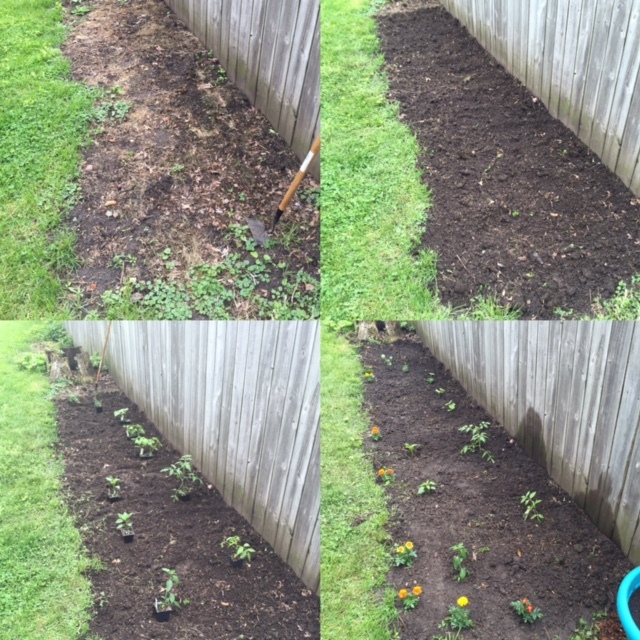 I dug in the dirt and spent time outside with my awesome husband. Great things happen when you are connected to a community, and this weekend was a great reminder of that.